Whether you're planning an event for your college roommates or looking for an alternative to the traditional bachelor party, poker parties provide a fun and relatively inexpensive way to enjoy an evening with your friends. From the beginner to the bluffing expert, everyone can have a great time. Once you have basic supplies on hand, including easy food and drinks, a full night of entertainment is all set. If you're planning to play for money, check your local gambling laws. Nothing spoils a great poker party faster than a visit from the police. Most poker parties have between six and 20 guests, although this number is somewhat flexible. Don't be afraid to mix things up a bit as you're creating your guest list. Poker parties appeal to both teenagers and adults. Although the game was once more popular among men, an increasing number of women love to play as well. For poker parties that include several inexperienced players, it's a good idea to create handouts that contain a brief summary of the rules of the game. Fresh decks of cards. You should plan on having one or two decks per table. Poker chips. Generally, $1 is white, $5 is red, $10 is blue, $25 is green, and $100 is black. However, you can use any denomination you choose or opt to avoid playing for money all together. Plan on between 50-100 chips per person. Dealer buttons. If you're on a tight budget, you can make your own. 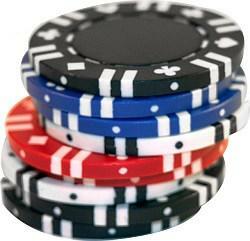 Supplies for poker parties can be purchased as individual items or as part of a complete kit. Check your local party supply store or shop online for a more extensive selection. Casinosupply.com has balloons, banners, centerpieces, invitations, tableware and disco balls. M&Npartystore.com has party packs that contain everything you need to throw fun poker parties. If you're feeling extra clever, use spade, diamond, heart or club-shaped cookie cutters to create a memorable tray of meats, cheeses and crackers. Decorated cakes or cookies are also a possibility if your guests prefer sweets. In the interest of cleanliness, it's best to make a rule that no food or drink is allowed at the game table. Whether you play for money or strictly for fun, a card-themed party is a festive way to introduce guests from all walks of life. The poker expert gets to showcase his skills, while beginners learn valuable lessons. Don't be surprised if your party goes on until the wee hours of the morning. As long as there are hands to deal and chips to win, players will want to play.